2015 Oscars – What a Good Work! | God has your back! ← Is Your Prayer Okay? 2015 Oscars – What a Good Work! I took this photo of my youngest granddaughter Haley a few months back while we were hanging out in a furniture store. This shot of her holding a candlestick as she looked in a mirror reminded me of someone giving an acceptance speech at the Oscars. While I think she is a star, I am not sure that is in her future. I do know this, she is sweet and smart, she loves her family and doesn’t even mind sharing her candy. And I know that the Lord has plans for her. 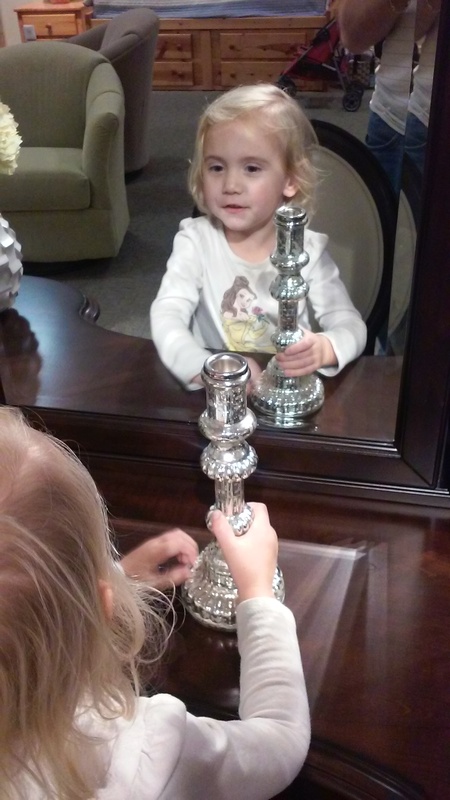 As I saw her looking in the mirror holding that candlestick which reminded me of an Oscar, I thought of Philippians 1:6 which says, “For I am confident of this very thing, that He who began a good work in you will perfect it until the day of Christ Jesus.” I know the Lord will keep His hand on Haley and her sister Avery. They are being raised in the grace and knowledge of the Lord and I am confident that He will do a good work in them and through them. This entry was posted in 2015 Oscar winners, Christianity, faith, God, grandchildren, Oscars, Philippians 1:6, religion and tagged 2015 Oscar winners, Christianity, faith, God, grandchildren, inspirational, ministry work, Oscars, Philippians 1:6, religion. Bookmark the permalink.